Christmas is a super time for catching up on that mountain of unplayed Steam-sale/impulse purchase games. At least, in theory. In practice, you mostly end up sleeping, eating and visiting people, and barely have any personal time. There are officially far too many games now for any one person to be able to come near playing all of them in a given year. Should you be looking for some less obvious choices, here are 20 games that might have slipped under your radar in the past 12 months - certainly, some of them escaped our notice until recent weeks. Kotaku UK&apos;s three main contributors share five favourite games each from 2014. With the art style of Borderlands and the gameplay of Doom/Quake this is a mindless blaster designed specifically to be just that. The writing and cutscenes are a little low rent but the rest of it is exuberantly overplayed. The motion for example is almost too fast when you start but soon settles into a groove as you zip and slide past enemies hammering ‘fire’ like crazy. It can feel a little poorly balanced at times but if you have fond memories of first person shooters from the 90s, built around nothing but circle strafing, then this could be worth a look. Think DayZ: The Board Game. This isometric post-apocalyptic survival adventure plays more like a digitised table top RPG than a real game, with text and minimalist icons replacing anything approaching ‘graphics.’ However, despite the barebones setup, the desperate attempts to survive can feel horribly real. It’s hard too. Both to understand its gameplay and to then work it to your advantage as you craft items and scavenge areas for supplies. Think of it as a far less humorous FTL with a much, much higher chance of dying pathetically of diarrhea in a ditch, and you’ll get the idea. The world’s premiere pigeon-dating simulator made its way to the UK this year and it’s got more to it than just the weird factor. There is, shall we say, an unexpected twist. Honestly, none of us have played this yet, BUT it’s top of several of our lists because of the rapturous reception it’s received from those who have. The Talos Principle is a philosophical PC puzzle/adventure with almost Portal-y execution. By all accounts it’s brilliant, and it really stretches your mind. Transistor got plenty of attention when it came out - and deservedly so, it’s super - but that was back at the beginning of the year, so it’s easy to forget about it. It’s much more complex than it might seem, but as our review outlined, it’s worth getting to know. While this might not be quite as clever or as heartwarming as it wants to be, this is still a lovely adventure. The cartoony take on the First World War follows a group of heroes as they struggle through the conflict in a pretty illustrated art style. The animation creates a unique-looking world, especially considering the dark nature of the backstory. It can fumble at times, with mechanics that seem too basic one minute or unclear the next. But if you like a good narrative yarn then this is a great time filler over the holidays, especially as you can now get it on tablet. This is one of those games that seems tailor made for Vita. I’ve not played the PC version so I’ve no idea how well that works but on handheld the tumbling, barely controllable shooter is near perfect. There’s basically only one level - an ongoing dogfight that sees you loosely steer a plane through progressively more dangerous skies - but it’s the levelling up progression and the skill/luck gameplay that makes it so enjoyable. There are parallels to Hotline Miami here, where you can claim the victories as your own and blame the failures on bad luck. While there’s so much ‘just one more go’ juice squeezed in here that a quick play can demolish entire afternoons. If there’s a game awards category called ‘most like a cheese dream’ then this would win hands down. A sinister Lynchian meets Tim Burton platformer about a baby with an upside down face and her balloon. It made good use of the Vita’s controls as you used the touchscreen to pull the child along by the hand, or tilt and tap to solve puzzles. It was deeply trippy and eternally weird, with both a sound design and art style pitched to make your skin crawl. Yes, it’s another crafting game but this is one focused purely on vehicles, bringing with it a world of comedy crashes, failed flying machines and, very occasionally, beautifully engineered triumphs. It’s still in beta at the moment but even in a raw form the ability to connect blocks, wheels, hover pads, wings and weapons in the pursuit of functioning cars and aircraft is already an immense amount of fun. You can easily lose hours just doing that, without going near the resource gathering/base building side of things. How many video games have you played that were genuinely funny? Maybe three? Jazzpunk can totally do funny. It’s a first-person, surreal adventure game that feels like it might be set inside the mind of Hunter S. Thompson, surprising and bizarre and genuinely hilarious. Every time you think “what would happen if I did… this?”, the game rewards you for it. It is absolutely worth a few hours of your time. 80days is a clever, beautifully written re-interpretation of Jules Verne’s classic story, in which you play the hero’s valet, deciding what routes to take and where to go to circumnavigate the globe before time runs out. It’s one of the best pieces of interactive fiction ever, actually, and certainly of the past decade. Velocity 2X is a super fast-paced shmup-platformer-puzzler hybrid with fantastic visuals and sound that makes you feel like your brain has been rearranged after playing it for more than an hour. It’s like having your drink spiked at a club in space. It’s on PS4 and PS Vita, and was free on PS Plus a wee while back - you might have it in your library already. This is like Pac-Man for the new generation, all about speed and high scores and pattern recognition, with a mind-melting perspective twist. Plus, it stars a cat, which is obviously good news. This is a pretty basic, almost old-fashioned, stealth game, but still a sturdy one with some memorable levels and rewarding action. That slow-mo bullet cam doesn’t get old, even hours into the campaign, and there’s something satisfying about a game built exclusively around sniping: it encourages you approach shooting in a different way. As a result this might not be groundbreaking or new but it’s unlikely you’ll regret lining up a few headshots. Bleak? Yes. Depressing? Yes. Fun? Well… “compelling” would be a better word. This is a war game that depicts what war is like for the ordinary people left behind in ruined cities, like an incredibly downbeat Sims. It’s extremely difficult to complete, though I guess “survive” would be a better word. Terrible things happen continuously, and even if your survivors’ physical state holds firm, their mental state might not. This was in our games of 2014 feature, but there’s a good chance that many people still aren’t aware of this superb multiplayer sword-fighting game. Years in the making, it’s pretty much a perfect video game: one on one, swords, showers of pixelated blood. It’s out on PS4 now as well as PC. Get it get it get it. This is honestly the best skateboarding game since Tony Hawk’s Pro Skater 2, another superb score-chaser on Vita (and British-made, too, like Velocity 2X). It’s demanding, precise and has oodles of one-more-go factor. Once you get used to pressing X to land. Great music, too - get your headphones on. It’s ‘a viking-themed tactical role-playing game’, as stated on Wikipedia. As such, Banner Saga should be an insta-purchase for most of you. It helps that the game’s really good too, offering Final Fantasy Tactics-like turn-based strategy and a well-written story that you have a profound impact on as you play. You’ll soon have zero excuse to miss it, as The Banner Saga will be available on pretty much everything. 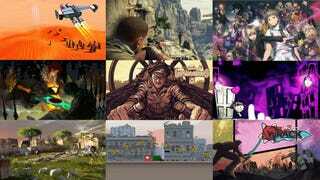 Hey, it’s not been a bad year for the Vita in terms of interesting games, has it? Famous within a small sub-section of Japanese visual novel fans and completely unknown to everyone else, the Dangonronpa games on Vita are very weird, ever so slightly schlocky but entirely compelling murder mystery games. Think Phoenix Wright in high school, but darker. Both of them came out this year in Europe. Inventive, creative and hands down one of the most unpleasantly scary experiences of the year, Silent Hills’ “Playable Teaser” deserves a special mention. It’s unexpected, genuinely threateningly horror and creates an entire world out of its weird looping structure - you’re trapped in an area that repeats over and over but somehow is never the same. If you avoided it for any reason (like its demo status) it’s worth rectifying as it’s one of the highlights of the year. Not only does it demonstrate Kojima can be brilliant outside of MGS, it also sets a high standard for the actual game.